Cloudy skies early, then partly cloudy after midnight. Low 43F. Winds NNW at 15 to 25 mph..
Cloudy skies early, then partly cloudy after midnight. Low 43F. Winds NNW at 15 to 25 mph. 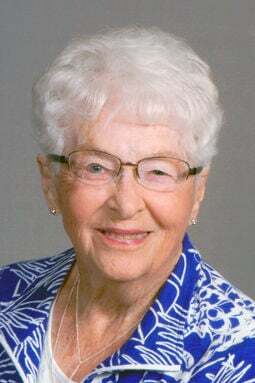 Violet E. Stork, age 93, of Fremont died Tuesday, March 26, 2019, at home. Violet was born Sept. 28, 1925, on a farm near Arlington to Paul and Elsie (Dahlkoetter) Knecht. She was baptized and confirmed at St. Paul’s Lutheran Church north of Arlington. After graduation from Arlington High School in 1944, she moved to Fremont and worked at Gamble-Skogmo and Kimberchicks Hatchery for a few years. In 1976 she went to work for Jacobs Floral and Bridal Shoppe, purchasing the bridal shop in 1983. In 1996 she sold the shop and retired. She married Victor H. Stork on April 27, 1947, and he died on Nov. 4, 2002. She belonged to Trinity Lutheran Church where she was a member of the Trinity Lutheran Women, Trinity Quilting group, Ladies Aid and card club. She volunteered at Fremont Area Medical Center for 18 years. Survivors: daughters, Rita Smith of Fremont, Diane (Gary) Feldman of Litchfield; sons, Kevin (Terry) Stork of Elkhorn, Dale (Kathy) Stork of Arlington; five grandchildren; seven great-grandchildren. Violet was preceded in death by her husband and sisters, Lucille Knecht and Darleen Schmidt. The funeral will be 10:30 a.m. Friday, March 29, at Trinity Lutheran Church in Fremont. Lunch will follow the service with the burial to follow lunch in St. Paul’s Lutheran Cemetery, north of Arlington. Visitation will be Thursday from 3 p.m. to 8 p.m. with the family receiving friends from 6 p.m. to 8 p.m. at the Ludvigsen Mortuary Chapel in Fremont. Memorials are suggested to Trinity Lutheran Church, Trinity Lutheran School and Trinity’s Katie Comfort Dog Ministry.